For international travellers, Athens is most easily accessed by plane. Eleftherios Venizelos International Airport is located about 20 km to the east of central Athens and 23 km to the east of the conference hotel. It is connected with public transportation (metro, bus) with the center of Athens. For more information on how to reach conference venue please visit the Venue section. 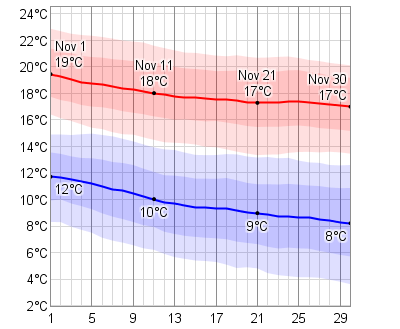 The month of November is characterized by gradually falling daily high temperatures, with daily highs decreasing from 20°C to 17°C over the course of the month, exceeding 23°C or dropping below 13°C only one day in ten. The daily average low (blue) and high (red) temperature with percentile bands (inner band from 25th to 75th percentile, outer band from 10th to 90th percentile) are shown below.